Monday Mar 31 – The weather is improving, and it’s great to be outdoors away from the congested roads and cycling by the River Wandle. The back streets we use seem unusually quiet today, it’s the last week of term before the Easter holiday. April recognises people we see regularly on our journey, and cycling means she becomes part of her community – not just another car travelling through the local area. She’s standing out of her saddle quite a bit, so I think it’s time to raise the height of it. There’s lots of bikes at school today as a number of the older kids are taking part in Bikeability. April is learning many of these skills now. On the way home, I ask her to pull in behind a parked car to allow a motorist to pass us, she quite correctly comments that ‘the road is not only for the car’ and I am a proud Dad. I tell her that the road is a space for people, bikes and cars that we all share. When we get home I raise the height of her saddle, and she tries it out for size in front of our house. ‘That’s better’ she tells me. Tuesday Apr 1 – Again it’s a beautiful morning and whilst the traffic along London Rd is incessant, once we have crossed via the pedestrian crossing, April and I can relax into the school commute. It seems quiet again today, although there are many cars around Culvers House School. April has to be aware of other parents dropping their kids off by car. Most days at the end of Medland Close, (which is a shared footpath/cycle route) there are two cars parked side by side, this means we need to cycle through the narrow gap left between them. Every day I tell her to be aware of people opening car doors as she passes through, this spot really needs to have a parking restriction even if it only covers the school day. As we pass through Westcroft Centre car-park, she does an exuberant double circuit through the large puddle that’s often there and we follow the road up to Carshalton. 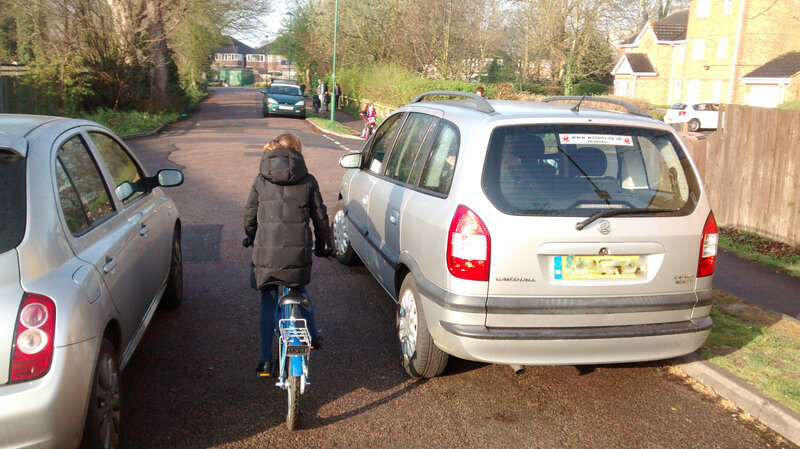 I ask April what the worst part of the ride to school is, expecting her to name somewhere she has to share space with cars, instead she says ‘it’s the bits that are uphill’. On the journey home, we are joined by Mummy, so April is keen to show her the route home. Tomorrow is ‘Car Free Day’ at school, I wonder if we’ll be able to notice any difference? Wednesday Apr 2 – Car Free Day. April’s school seems to have taken a new interest in sustainable travel. I am not sure what’s prompted this, whether it’s a Sutton Council initiative or something the school have devised themselves. I know within the school the children have been looking at air pollution. Perfect timing I suppose, as our streets are more polluted than Chinese cities. As more people are now dying from the effects of air-pollution than obesity, they certainly should be looking at its damaging consequences. April’s school is one of 1000+ schools in London to be situated close to heavily polluted roads. For those of you that are interested, you can look up how polluted your road and school is here. Of course cycling is an elegant solution to the twin issues of obesity and air pollution. Our journey to Carshalton is notable for a couple of things, we stop and stroke a dog called Bella. April wanted to stroke the dog as it looks like her aunt’s dog, we also spot the very hairy cat she sees regularly ,which she calls has ‘fluffed up cat’. As we cross Hackbridge Rd, a guy in a white van stops and allows us over. When we arrive at school Car Free Day looks to have been a success, no doubt helped by the dry weather. The roads around the school are significantly quieter, and the experience is much more pleasurable. I even over-hear one parent commenting that ‘even the air feels cleaner’. More days could be like this if there was a commitment to cycling. Our journey home is marred by the actions of an aggressive and impatient driver of a ‘horticultural services’ vehicle. Whilst we are riding along Mill Lane, the driver unable to pass due to vehicles coming from the opposite direction, drives close behind us, needlessly revving his ageing diesel engine. As he passes, he takes the trouble to shout some abuse from his wound down passenger window. At a six-year-old girl riding home from school. In my opinion, this man is unemployable in a role that requires him to drive. After he’s gone April asks me why he was so noisy, and tells me that she didn’t like it and was scared. Unfortunately, learning to ride in this country also means learning to deal with such abuse and threatening behaviour.